Increased research spending is a sign of an advanced, successful economy. China’s rising investment in research and expansion of its higher education system mean that it is fast closing the gap with the United States in intellectual property and the struggle to be the No.1 global technology power, according to patent experts. While U.S. President Donald Trump’s threat of punitive tariffs on high-tech U.S. exports could slow Beijing’s momentum, it won’t turn back the tide, they say. Washington’s allegation that the Chinese have engaged in intellectual property theft over many years - which is denied by Beijing - is a central reason for the worsening trade conflict between the U.S. and China. Forecasts for how long it will take for Beijing to close the technological gap vary - though several patent specialists say it could happen in the next decade. And China is already leapfrogging ahead in a couple of areas. “With the number of scientists China is training every year it will eventually catch up, regardless of what the U.S. does,” said David Shen, head of IP for China at global law firm Allen & Overy. Indeed, IP lawyers now see President Xi Jinping’s pledge earlier this week to protect foreign IP rights as projecting confidence in China’s position as a leading innovator in sectors such as telecommunications and online payments, as well as its ability to catch up in other areas. Last year, China overtook Japan as the No. 2 patent filer in the world, with 13.4 percent annual growth, according to the World Intellectual Property Organisation. If maintained, the pace will take it above the United States in just over a year, a strong indication of its ambitions. That progress has been built on foundations which are likely to strengthen further. 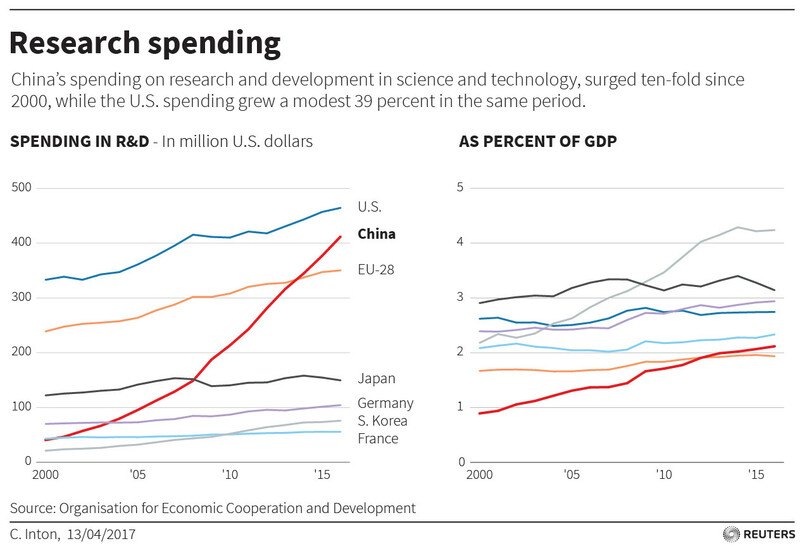 The US and China spend the most on R&D. China now spends 2.1 percent of its gross domestic product on research and development, not yet matching U.S. levels of 2.75 percent, but a remarkable increase from just 0.7 percent in the 1990s and nearing the 2.35 percent average among members of the Organisation for Economic Co-operation and Development. World Bank data shows China now produces 1,177 R&D researchers per million of its population, three times the level in the 1990s and in line with the world average. The U.S. produces many more researchers per million - at 4,321 - but that is more than offset by China’s population being about four times the size. And the number of Chinese researchers is only going to increase. According to United Nations Educational, Scientific and Cultural Organisation, China now enrols more than 40 percent of its students in tertiary education, half the U.S. percentage, but a staggering rise from 0.1 percent in the 1970s. “If you’re looking out 5-10 years you’ll see a much more level playing field in terms of innovation, especially around online platforms, digital innovation, machine learning and artificial intelligence,” said Richard Titherington, chief investment officer for Asian emerging markets at J.P. Morgan Asset Management, who overseas $80 billion in assets. He said that stock markets provide one sign of Chinese progress - at least in the eyes of investors. The total returns on Facebook Inc stock since its listing in 2012 were 373 percent, versus 883 percent for its Chinese social media rival Tencent Holdings. In microblogging, Twitter Inc returned a 28 percent loss since its 2014 listing, while Weibo Corp a whopping 656 percent gain. IP experts, however, say China is still behind in areas such as semiconductors, robotics, and biotech. Patent numbers also do not tell the whole story. There is a perceived gap in quality, which suggests China will take a while longer to catch up. 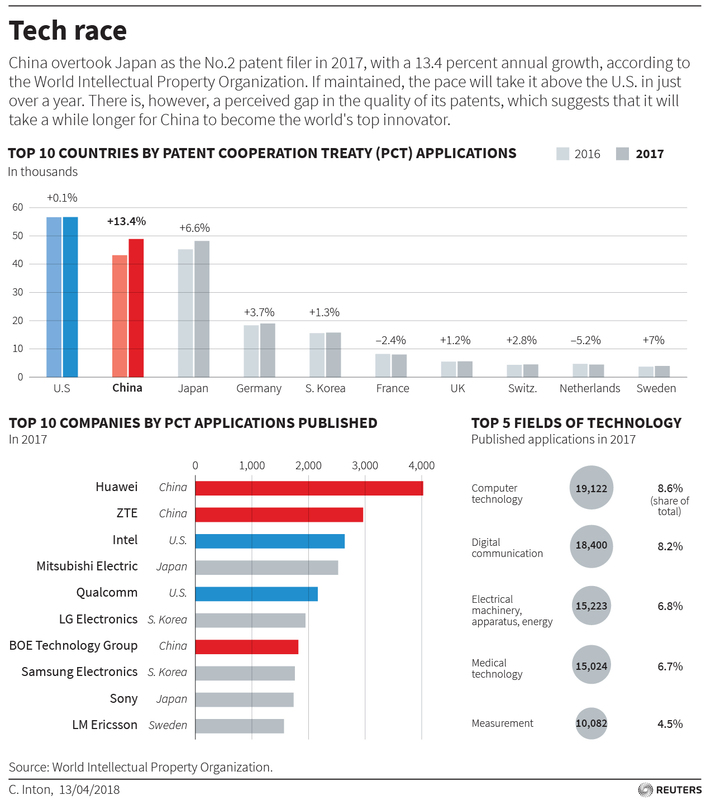 The US and China lead the world in patent applications. Smartphone maker Huawei Technologies is the only Chinese company that made it into Clarivate Analytics’ top 100 innovators last year, a ranking based not only on patent volumes, but also on their influence on other organizations. In 2016, China produced almost 500,000 scientific papers according to data from global information analytics firm Elsevier, taking the No.2 spot globally and closing in on America’s 600,000. The gap has halved in five years. But on average, a Chinese paper gets 0.93 citations, versus 1.23 for U.S. documents. Citations are an indication of how valuable a researcher’s work is seen by his or her peers. On that metric, China is 11 places behind the United States in 33rd, with only countries that published more than 10,000 papers included. Gabriela Kennedy, head of Asia IP at global law firm Mayer Brown JSM, says that could be a proxy for the quality of each country’s research work. If Washington wants to slow China’s technological advance, it might consider measures that further restrict what products U.S. companies license to Chinese firms and broaden definitions of trade secrets, lawyers say. But they also warn tougher rules could be counterproductive as firms can find ways around them, including by setting up entities in non-U.S. jurisdictions to maintain access to the vast Chinese market. “If the U.S. government were to go to the extreme of not allowing U.S. companies to disclose their IP in China, that could hurt the U.S. companies as well,” said Ling Ho, a partner with law firm Clifford Chance, and a specialist in IP disputes. Xi pledged on Tuesday China will protect the intellectual property of foreign firms, saying he hoped foreign countries did the same. Lawyers say Chinese IP protection laws are comparable to U.S. and European legal standards. The fault is in implementation, with high levels of bureaucracy, court decisions applying on a provincial level rather than nationally and judges often having different interpretations of the laws. The recent creation of a State Intellectual Property Office, however, shows political intent and should lead to more uniform enforcement, said Loke-Khoon Tan, head of the IP Practice Group in Hong Kong and China at Baker McKenzie and author of the book “Pirates in the Middle Kingdom: The Art of Trademark War”.